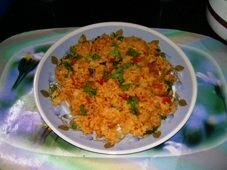 Tomato Rice is a tasty and easy recipe. It is convenient to pack to the children and office goers. Chopped coriander leaves - 1 tbps. Heat up a thick bottomed pan and add oil. Add mustard seeds. When the seeds splutter add tur dal, and curry leaves. Add chopped onion pieces and saute for about two minutes. Add tomato pieces, turmeric powder, chilli powder and salt. Once it becomes a thick paste add the cooked rice and mix well. After about 3 minutes, remove from the fire and add coriander leaves. Interested in Indian Recipes? Download Instantly - I000 Indian Recipes Click Here!